Recent decades have seen the appearance both in print and in electronic form of many important contributions to the study of Church law in the eleventh and first half of the twelfth century. The picture that Paul Fournier and others had sketched prior to 1940 of Latin canon law between the time of Bishop Burchard of Worms (d. 1025), and Master Gratian (c. 1140), has been redrawn on the basis of new manuscript discoveries, new editions, and new interpretive works. Yet in spite of the progress that has been made, much remains to be done because the sources that still are to be analyzed are numerous. Of great importance and utility in this regard, as Dr. Rennie indicates (6), are the volumes compiled by Lotte Kéry , and especially by Linda Fowler-Magerl. These works constitute essential tools for study of the manuscripts of canonical collections prior to the Decretum Gratiani, and both also contain useful bibliographies pertaining to the collections treated, although these lists can be supplemented with titles published more recently. Of special note, furthermore, is the fact that the Clavis canonum includes a CD-ROM which is a treasury of information. This disk represents a textual harvest of Dr. Fowler­Magerl's many years of research describing and categorizing over 100 canonical collections that were assembled before the mid twelfth century and the appearance of Gratian's Decretum. The resulting data base offers analyses of selected manuscripts of the collections treated, and provides information such as rubrics, inscriptions, and the incipit / explicits of canons. Having these details now at hand about unedited pre-Gratian canonical collections is of immense value for historians of Church law. 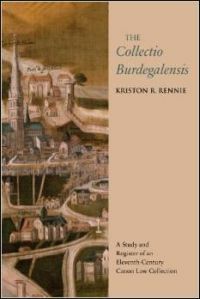 Dr. Kriston Rennie is Senior Lecturer in Medieval History at the University of Queensland in Australia. His previous publications include a much needed monograph on the late-eleventh­ century papal legate, Hugh of Die / Lyon , and the present study is an excellent example of how to describe and study an unedited canon law collection of the period of Church reform sometimes termed the "Gregorian Reform". These works frequently are anonymous, lack both prefaces and significant commentaries and glosses on the legislation included, and per se offer little guidance about how they should be interpreted. Yet legal collections do not arise in a vacuum, and they appear at a given time for definite reasons. But locating the place of origin and the rationale behind such compilations requires multiple investigations, e.g., full description of the manuscript[s] in which the collection survives including the supplements and additions to the main work, evidence for the provenance of the work's codex / codices, identification of the formal sources employed and study of how those sources were used and manipulated (e.g., combined, abbreviated, misascribed), comparative analyses of other collections from the same time period / place, etc. The present study, aware of such factors, thus both builds on and expands the presentation in the Clavis canonum. Short of modern, critical editions, the Clavis offers an analysis of a canon law collection that was assembled north of the Alps, specifically in western France, during a vibrant period of ecclesiastical Reform in the late eleventh century. The Collectio Burdegalensis, or the "Bordeaux Collection" [BC], is known today in two manuscripts written around the turn of the eleventh century: Bordeaux, Bibliothèque municipale 11, fols.147r-71v, and Würzburg, Universitätsbibliothek, M.p.j.q.2, fols.2v-96r. Both books are of French origin, and both contain a group of supplemental legal texts, at the end of BC, which are similar but not identical in the two exemplars. The canonical collection as it survives in the former book, which derives from the abbey of La Sauve Majeure near Bordeaux, is fragmentary and breaks off in book 7. This manuscript has been described in the Catalogue général des manuscripts (vol. 23; 1894), and BC per se was analyzed soon thereafter by Jules Tardif. The Würzburg manuscript was brought to attention by Dr. Herbert Schneider in 1996 (Clavis canonum 129-32). The book comes from Saintes, was owned by Bishop Peter of Saintes (c. 1107-1111? ), subsequently became part of the library of Nicholas-Joseph Foucault (1643-1722), and then made its way to Würzburg. These two manuscripts are given discursive descriptions on pages 24-29, including a notice of the supplements to the main collection (at times called "Appendices"), and on pages 52-53 what is termed a "Codicological Summary" of each of the manuscripts is provided. A reader can be somewhat baffled at the placement of this latter set of information, which might seem more appropriately offered earlier, perhaps incorporated into the discussion prior to page 24. A series of six "Tables" (28-50) facilitate a reader's assessment of the elements and the collections. At the end of the second section of his "Introduction" (24), Dr. Rennie provides a convenient summary of his perspective on the Reform background of BC. He describes "an intersection" of papal legates, councils, French nobility, and law. The regional councils at Poitiers in 1078, and at Bordeaux in 1079 and 1080, gave interested participants access to canon law material. The compiler[s] of BC would have come across the main sources of the work, i.e., the important and extensive early eleventh-century Decretum of Bishop Burchard of Worms, and the later eleventh-century reforming canon law collection known as the Collection in 74 Titles. The legal core (the formal sources) of BC were hence in hand. The result was a legal compilation the bulk of which derives from Burchard, with additions from 74T, which is a work that essentially is distilled from the Pseudo­Isidorian Decretals. The editors of BC, therefore, either ignored or did not have access to papal texts from the second half of the eleventh century. The latest items included in the BC proper is a set of canons from the legatine synod held by Hugh of Die at Poitiers in 1078 (Bk. l. (123); see 82), although both manuscripts include a very small number of later texts (see 24-26). Following the afore-noted discussion of the two manuscripts (24ff; see above), the author offers a detailed sketch of the collection, with special attention given to the interlocking presence of the two principal sources. Burchard provided canons about "conciliar and legatine mechanisms for church reform", but also "a particular monastic orientation", and this in all probability strengthens the case for BC's likely provenance at the abbey of La Sauve Majeure. "[T]here it would have served as a valuable reference tool" (36). In Section 4 of the "Introduction", finally, Dr. Rennie addresses the question of whether or not BC can be considered, as is the case with a number of French canonical compilations of the period, to be a "Poitevin" collection. He is skeptical about that home for the compilation, and argues instead for an origin at Bordeaux. Notwithstanding the useful wealth of information contained in the Introduction, the heart of this book is the nearly 150-page analysis of BC according to the basic format established in the Clavis canonum. Utilizing both of the known manuscripts, Dr. Rennie presents what is termed, somewhat modestly perhaps, "A Register" of the compilation. The criteria used to establish this canon-by-canon description of BC, and the editorial conventions that governed that presentation, are laid out in detail on pages 53-55, in a section titled "Editorial Conventions", which also lists works that are cited in an "apparatus fontium" at the end of each canon. Following the 16 books of BC and the Appendices is, finally, a Bibliography, a list of the Incipits of the collection's texts, a list of attributions - councils, popes, and others - of the canons (according to the book and canon number of BC), and an index. The work is produced in an attractive format as would be expected for a volume produced by the Pontifical Institute in Toronto. This included a dust jacket that reproduces a plan of the city of Poitiers under siege in 1569 by forces of Gaspard de Coligny, Admiral of France, as depicted in a drawing by François Nautré in 1619. One can wonder, in conclusion, about the symbolism of this scene on the cover of Kriston Rennie's impressive monograph. Was it selected, at least in part, "to attack" modern scholarly claims about a Poitevin origin for BC? Lotte Kéry: Canonical Collections of the Early Middle Ages (ca. 440-1140): A Bibliographical Guide to the Manuscripts and Literature, Washington 1999. Linda Fowler-Magerl: Clavis Canonum. Selected Canon Law Collections Before 1140 (= MGH Hilfsmittel; Bd. 21), Munich 2005. 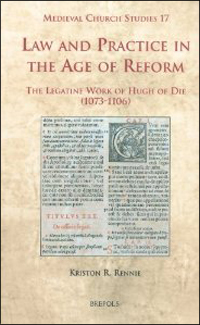 Kriston Rennie: Law and Practice in the Age of Reform: The Legatine Work of Hugh of Die (1073-1106), Turnhout 2010. Jules Tardif: Une collection canonique poitevine, in: Revue historique de droit français et étranger 21 (1897), 149-216.